Mike Drake was an asset to the Institute of Plumbing South Africa, his drive and pledge to the Institute of Plumbing was admirable. As members of the IOP (KZN), it is necessary to take a page from his book and reignite our passion for our trade. Our Heritage was established with great gusto by honourable men such as Mike Drake; let us join in uplifting tomorrow and in support of one another. 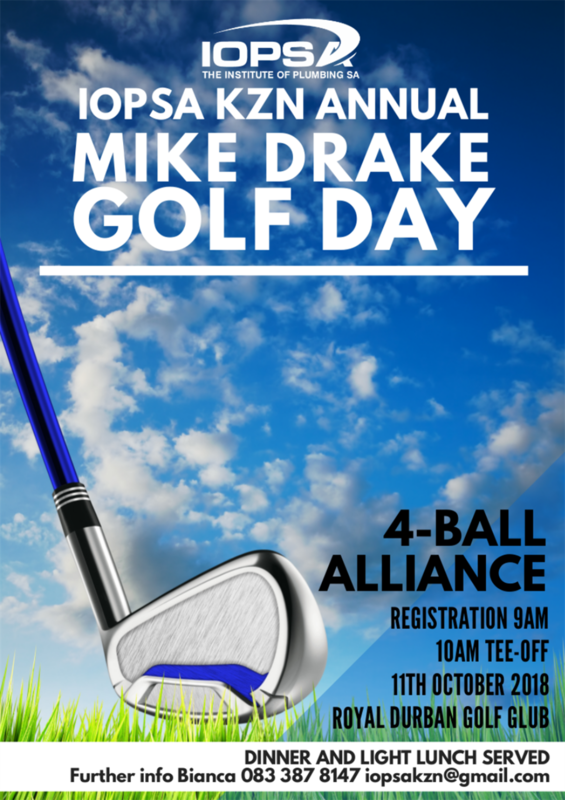 As always, the Mike Drake Memorial sees the Plumbing fraternity come together, we look forward to a memorable day with a field of 120 golfers made up of plumbers, wholesalers, suppliers & manufacturers, all allied with the plumbing industry. The opportunity presents itself for vast networking capabilities and growth within our industry. The day’s agenda will include a round of golf, with lots of happenings on the course (maybe even a shot or two!) and halfway voucher, followed by dinner and a brief prize-giving evening from 18H00. All proceeds on the day will go back into the event in the way of prizes etc., to make this a memorable golf day for years to come. The KZN Committee are proud to announce the 2018 Price lock; bringing you the same Astonishing event at 2017’s price per Four-ball and Sponsorship!